It was December 2015 and I was ready with my DNA swab kit to send to the FamilytreeDNA Lab for analysis. What follows below is an account of a series of seemingly unrelated events and discoveries over a number of years that led me to that point and a startling possibility about my ancestry. I was born in 1954 in Southend on Sea. 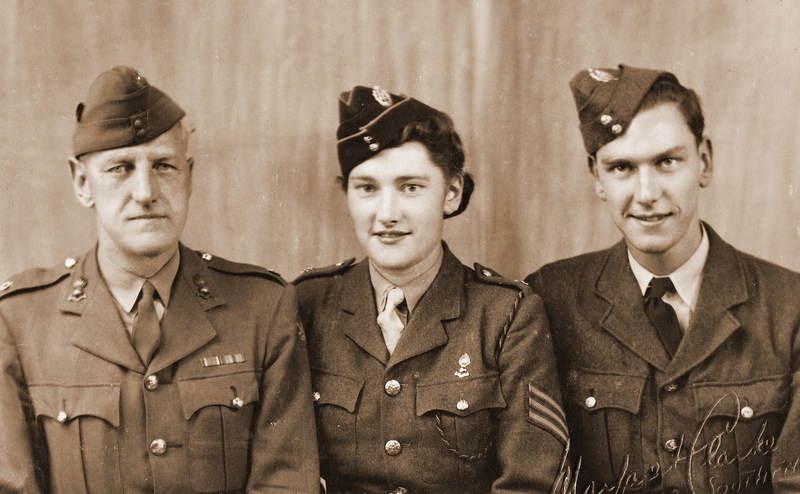 Dad, Rowland Emptage, was born in Pembroke Dock in South Wales and his father was Ernest Emptage, a career soldier at one time garrisoned in Pembroke Dock but born in Kent. Ernest was dead before I was born and so I grew up not knowing very much at all about my Emptage family roots. I did know the name was unusual… well you do when you have to spell your name every time you are asked it. Dad had been told the name was French and that our ancestors were either smugglers, pirates, Huguenots or Napoleonic POWs. Nice stories for a small boy but later research show a strong possibility that this was all nonsense. The reality maybe a little less romantic but just might be even more amazing. I opened my first internet account 19 years ago and just like everyone else the first thing I did was type my name into the Search box. ‘EMPTAGE’. Up to this point in around 40 years I’d met just one Emptage outside my immediate family and that was (fleetingly) in an Estate Agents in Fulham in the mid 1970’s. In fact she is still the only other Emptage I’ve met. Now however, the wonder of the internet was throwing up Emptages across Britain and in the US and Canada. All linked by an unusual surname but I thought little else. In 2004 the BBC aired the first episode of Who do you think you are? By then you could access online mind boggling amounts of family research data and I was one of the many that started to research at that time. Building a tree using census records and posting that tree on Genes Reunited and then being matched to others all round the world I quickly had an Emptage line that went back 300 years. The earliest 200 years of this line were agricultural labourers who lived continuously in a small area of Kent called the Isle of Thanet. I knew the Isle of Thanet. As a child we’d taken family trips on the steam boats from Southend Pier to Margate and in the early 60s, aged 8 or 9, we had a two week holiday with aunties, uncles and cousins in Broadstairs. I remember this for endless fun, sunshine, soft sand, the sea and football in a park at the top of the cliffs. Mum remembers self catering in a damp gloomy ‘dungeon’ below street level! What I had no idea of at the time was that these trips were taking me back ‘home’. Anyone who starts to build a family tree knows that things quickly get out of hand if you follow the maternal and the paternal lines and every sister and brother of every ancestor. I made the decision to limit the search to just trace my 16 great great grand parents to give the project some boundaries otherwise I knew I’d be too overwhelmed to ever start, or if I did start, it would never end. I found all 16 relatively quickly and with it the realisation that I am not just an Emptage but a part of a lot of people. I’d thought I was an Essex man but actually I’m approximately 25% Essex, 25% Bolton, Lancashire (mill workers and miners), 25% South Wales (mariners and shipyard workers) and 25% Kent (Isle of Thanet ‘Ag Labs’). I visited these places and online I got connected to other people who shared their research and expanded my tree. Fascinating social history was revealed through ancestors lives along with related stories of ‘machine breakers’ and heroic lifeboatman. In the back of my mind though was forming what was for me a much bigger story about my Emptage heritage and how close my ties were to all those other Emptages around the world. Much of the data for finding those 16 great great grandparents was found through the census records 1841 to 1901. Searching these records it quickly becomes clear that the overwhelming majority of Emptages were from Kent and that going back this was increasingly the case. With that possibility came the intriguing prospect that for all Emptages around the world today all roads lead back to Kent and possibly the Isle of Thanet. It seems pretty obvious that a lot of us Emptages will be related in some way but what if most Emptages are related? Why stop there ? What if all Emptages go back to a single ancestor? At that time, 10 years ago, I was working alone and hadn’t networked to any great degree with any other Emptage researchers. I had a little bit of a family tree going back to 1700 and neither the time, tenacity or expertise to keep building this tree back to see where it took me. So I blundered around amateurishly and just maybe got very lucky. It doesn’t take much imagination to conclude that the number of (English) Emptages going back would continue to reduce in number. Similarly the percentage of those Emptages born in Kent increasing from 71% in 1901 to 90% in 1841 strongly suggested that the number could have at some point been 100%. Furthermore, the overwhelming number of those Kent Emptages were from the Isle of Thanet so was it possible this is where it had all started for Emptages and could it have started with one common ancestor? Could the census data be extrapolated to give a clue? Out of curiosity I built a spreadsheet to plot the progressions going back using the 60 years of data I had. First I took the number of Emptages as a constant percentage of the overall population of England and then going back got a result of 56 Emptages in 1700 and 33 in 1350. This was taking the average percentage over the 60 year period. However, the number of Emptages increased by around 2 and ½ times between 1841 and 1901 whereas the population of the country as a whole only increased a little over 2 times. If we refine the progression back with this data we get a number in 1700 of 52 Emptages reducing to just 20 in 1350. This is statistics and should probably be taken with a pinch of salt as there are so many variables that can be thrown into this over the centuries covered. All the same, I felt that given the overall shape of the data I had, this speculation of maybe a couple of families of Emptages sometime between 1000 and 1400 might not be far out. These dates are quite significant. As with the DNA swab, we’ll come back to that later. None of this though, answers the question of where did the Emptages come from before Thanet and when did they get there? Whilst at this stage my own family tree only went back to 1700 through online searches I had found Emptages from Kent (in a variety of spellings) going back far longer. So how long had ‘we’ been there ? If more than 500 years was it 600, 1,000, 2,000 years? Memorial stones dated early 1600’s in the floor of the church at St Nicholas-at-Wade, Thanet mentioning Emptages. By now I knew that some of the fanciful French based family legends were chronologically impossible so was there any truth to any of it? The name certainly looks a bit French and can be pronounced with a French slant to it. Thanet is close to France. It makes sense. Except that never when searching the internet for Emptages has anything ever come up in France. All the countries that have had large scale emigration from Britain have Emptages. None in France. They could all have come over I suppose, or maybe the spelling has changed. I tried a variety of spellings and still got no ‘hits’ in France. I had strong doubts about the helpfulness of the French connection to answer the when and where from questions. Around the same time as I was doing this family research I was professionally in the middle of a project over several years photographing landmarks around towns across the UK from the Shetlands to Devon. I found that everywhere has something noteworthy nearby and it triggered a keen interest in all things British History. I photographed Stone Age ‘ceremonial’ circles, Iron Age forts and earthworks, Roman remains, Anglo Saxon churches, Norman castles, cathedrals and abbeys, Victorian Industrial heritage and so it goes on. 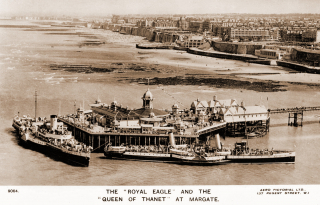 However much history may be all around us though, by comparison, the Isle of Thanet and its surrounds has an ‘Olympic’ standard place in Britain’s history. It was part of the land bridge that the earliest Britons walked across 12,000 years ago before melting ice water formed the English Channel. It was the landing point for the Romans, both Julius Caesar for his reconnaissance trip in 55 BC and later for Claudius and his conquering army in AD 53. In the 5th century at the end of the Roman era there is an account of the Jutes Hengist and Horsa coming to fight as mercenaries for a British King, Vortigern, and as reward being given the Isle of Thanet. In 597 Pope Gregory sent a mission to Britain led by Augustine to Christianise Kent, landing first on Thanet before arriving at Canterbury (which remains to this day the centre of the Church of England). Later came Vikings who initially carried out raids in the summer months before returning home for the winter. In 851 and 854 though they are reported to have wintered on Thanet. That is a lot of history. So let’s just quickly recap… I had a feeling, but no proof, that most if not all Emptages can be traced back to the Isle of Thanet. The Isle of Thanet has been at the sharp end of invasions of armies and new peoples since the beginning of British human history. There isn’t a shred of evidence to support the widely speculated French connection. And that is where I’d got to until, on a long drive to Aberdeen, a conversation on Radio 5 Live led to a lot of pieces of the jigsaw slotting into place and a giant step being taken towards a ‘Eureka’ moment. Simon Mayo was interviewing Professor Bryan Sykes about a Y chromosome DNA study he had undertaken of males in England who shared his surname. In summary the results of this study were that in all probability all Sykes could trace their ancestry back to a single man. That man had lived in Yorkshire and his name was a Norse word which was a stream or ditch, possibly marking a boundary. The first records of Sykeses are of families in three villages near Huddersfield in the 12th century. I found the shape of this story and its similarities to the Emptage story that was forming in my mind remarkable. If a relatively common name like Sykes had a common ancestor then surely Emptages might too. The earliest Sykes were located in a small region of England in the 12th century. All the information I had pointed to there having been at most a handful of Emptage families in another small region of England at roughly the same time. However, the bit of the story that really lit my head up was the Norse origins of the name Sykes and its meaning. The blindingly obvious that had passed me by all this time was to concentrate on the name Emptage itself and that would give a big lead on our earliest roots. Surnames were originally introduced into Britain by the Normans in 1066 and by 1400 had largely settled down and become hereditary. This fits in with the speculated date for the earliest Emptage families. Surnames were taken from a variety of sources. Professions such as Smith, Thatcher, Cook, Taylor. Nicknames like Little and Redhead or place names like Hill and Dale. 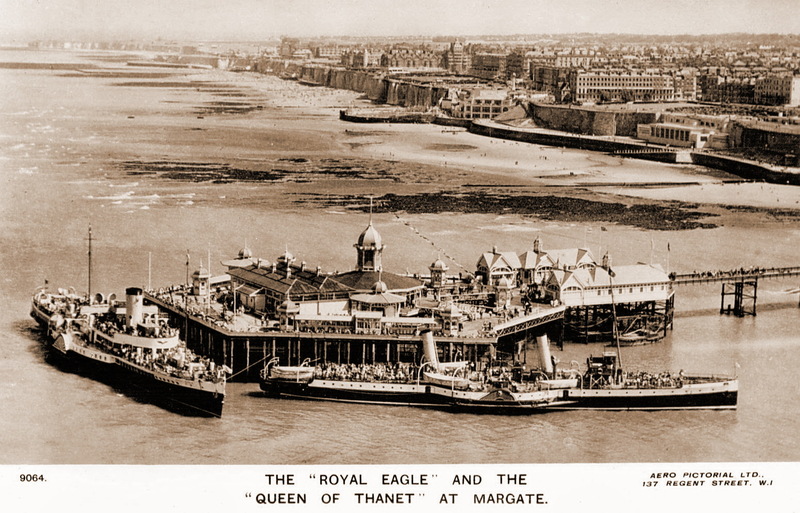 Emptage would mean something to someone but, as we’ve seen of Thanet’s history, was it the Romans, the Anglo Saxons or the Vikings that gave us the name ? Or was it after all, as family folklore would have it, a French name? What first struck me was that in all the times I had been to France and given my name, when checking into a hotel say, there had never been a glimmer of recognition of the name. No one ever said ‘oh that’s a French name’ or better still ‘that means XYZ in French’. I can even remember a French teacher at secondary school commenting that they had discussed the meaning of the name within the French department and had come up blank. So if not French what then? At this point I decided to do an online search based on every phonetic spelling of the name I could think of and see what happened. This is where I got very lucky. So lucky in fact that when I repeat the search today I get nothing. The link or the search engine algorithm have long since gone or changed. I remember quite clearly the search and the search engine. It was in Yahoo and the search was for ‘EMTIJ’. Within seconds I was looking at a web site showing an Anglo Saxon word ‘aemettig’ and a pronunciation ‘Emtij’. Wow wow wow wow wow! I was sure that this was it. We’d been on Thanet for a very long time indeed, we’re English and not French and possibly related back to one man in the 11th to 14th centuries. Who knows? Maybe his ancestors had been on Thanet for centuries before that. 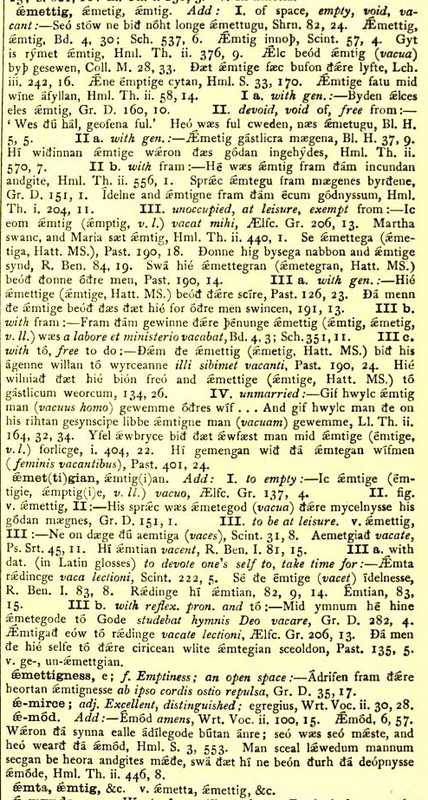 I also had a link to an Anglo Saxon dictionary that had this listing…. The word seems to have had a general meaning of without and is applied to a number of different circumstances but is the base of the modern English word empty. At this point, my immediate family being the only Emptages I knew, for fun I put together a fairly fanciful narrative involving Vikings and Anglo Saxons and shared it with them. Then all my notes went back into the ‘Family History’ box file and got forgotten. 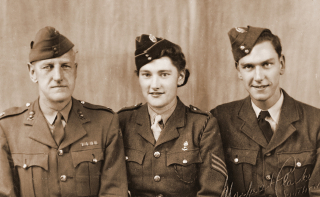 I’d found out as much about my family tree as I could without actually moving away from my computer and doing some real live family research out in the field and I had a workable theory about the long past roots of my Emptage family heritage. Ten years later, in July 2014, my nephew found a site called Emptages of Thanet and offered up some photographs he knew I had of Emptage memorials on the Western Front that I’d taken as part of a different project. To keep me informed he copied me in on the email dialogue he was having with the owners of the site. I was particularly busy at work at the time so this dialogue was on my periphery and I’m afraid I wasn’t paying a great deal of attention. Then the conversation concluded and was signed off with some gentle speculation about the name and the possibility of a Hugenout origin. This was too much! I had a theory they should know! In double quick time I sketched out a very brief and frankly incoherent summary and emailed it back to ‘Team Emptage’. What happened next was a bit disconcerting. A couple of days later I assumed that was that and I had been dismissed as a madman. Then Susan sent a detailed, thoughtful and positive reply making a start at polishing up my ramblings into a more considered and coherent story, in particular focusing on the topographical meaning of the extended ‘aemettigness‘. A short time later came news that a male Emptage (Roger) had submitted a DNA sample to FamilytreeDNA and that the results indicated Anglo Saxon and specifically Juteish ancestry. This was getting better and better! And so, in December 2015, I submitted my DNA sample at the beginning of what I hope will grow to be a Sykes style study. I was hoping too that my DNA results may go some way towards solving another puzzle. Roger’s lineage goes back to the Isle of Sheppey Emptages whereas mine is one of the two branches of the Isle of Thanet Emptages. At the moment there are Team Emptage contributors doing the kind of detailed legwork and research that I am in awe of and they are trying to establish a link between the two lineages. Maybe this DNA test would help with that link too and take us a step further in putting all the parts of the Emptage family history into place. Roger’s results had already shown that he is descended from the Anglo Saxons, specifically the Jutes who arrived here from Jutland (Denmark). And now, my 111 marker test results matched with those of Roger’s, concluding that there IS a genealogical connection between him and me, and therefore between at least one branch of the Emptages of the Isle of Thanet and those of the Isle of Sheppey. We are currently awaiting the results of two more tests: of a descendant of the second branch of Emptages in Thanet and of a descendant of the Barbados branch. If you are an Emptage male reading this please get in touch and get involved. The greater the sample the better the results will be.